Kithulgala, even more often spelt "Kitulgala", is a hamlet in the tropical Kelani river valley. Its lush green hills overgrown by tropical rain forest served as the setting of the world-famous movie "The Bridge on the River Kwai". In recent decades, Kithulgala has become the island's number one attraction for adventure holiday makers. Foreigners and Sri Lankans alike love excursions to Kithulgala. Large numbers of inhabitants of Colombo make the excursion at weekends to experience thrilling white water rafting or simply to play in calmer parts of the river and to enjoy a picnic in a delightful setting. The name "Kithulgala" is derived from the words "Kithul" for the fishtail palmtree and the common Sinhalese toponym suffix "-gala" for "boulder" or "rock". The Kithul tree (Caryota urens) is quite popular in Sri Lanka. For one up to one and a half decades, a Kithul tree is the source of a delicious syrup called Kithul treacle or palm honey in English or Kithul Pani in Sinhala. Crystallized as jaggery, Kithul is an important ingredient of many local sweets. Kithul is also cultivatedto be fermented to palm wine. Kithul flour is another nourishing product. The Tapping, usually done by men, and other Kithul production processes, carried out by women, can be studied in the area of Kithulgala perfectly well. The pith of the Kithul tree can be used to make sago, the fibres are a perfect material for ropes. When the tree is fallen, it provides hardwood timber. Kithulgala is Sri Lanka's best place to combine a variety of adventure activities such as rubber raft tours, white water kayaking, canoeing, hiking and trekking, botanical excusions and birdwatching, canyoning and waterfall abseiling, caving and last not least mountainbiking. There are many mountain cycling tracks covering several scenic locations and untouched villages around Kithulgala. Trails also run through Rubber Estates to reach the areas of Tea estates of the Central Highlands. Most holiday makers come to Kithulgala for a river rafting experience, whitewater rafting is undisputably the number one adventure attraction of this jungle paradise. Rubber rafts are available a few kilometres upstream, in the suburbs of Kalupahana or Yatiberia. All equipment will be provided, professional pilots guide the rafting tour. Though Whitewater rafting at Kithulgala is done during the night, this "Blackwater Rafting" is restricted to three nights on either side of the full moon days. The peak season for holiday makers is between Christmas and Easter, February being the driest month in Kithulgala. But the season for whitewater rafting at Kithulgala is the period of April to November, when the monsoon rains are increasing the water levels. 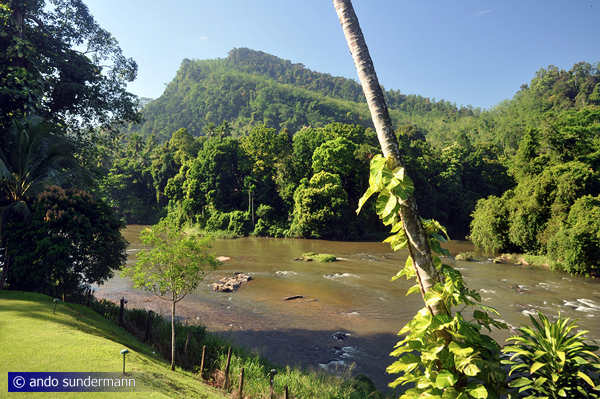 The Kelani Ganga is flanked by thick rainforest-covered hills. The river is wide at Kithulgala. It is shallow apart from a deeper channel near the souther river bank at the opposite side. During the local dry season, there are lots of attractive places safe for swimming. ​Within the outreach of the main monsoon between July and September, Kithulgala is one of the wettest places in the country. Annual rainfall is between 3,500 and 5,50o mm. Though the dominating fauna in the valley is wet zone rain forest, the altitude differences are the reason why the hillcountry of Kithulgala is also located in a transitional area between tropical lowlands and cool highlands. The Kithulgala bird sanctuary is inhabited by bird species from both biospheres, the rainforest as well as the mountainous region. Compared to Sri Lanka's largest pristine rainforest, Sinharaja, the Kithulgala's Kelani river valley has also stretches of secondary forest and rubber and tea cultivation and is more open, offering scenic views. Kithulgala (Kitulgala) in Ratnapura District is situated at the A7 mainroad, 90 km east of Sri Lanka's capital Colombo/Kotte and 60 km southwest of Kandy. The road distance to Dalhousie (Nallathaniya) Adam's Peak in the south is only 50 km. "The Bridge on the River Kwai" is a 1957 film by David Lean based on a novel of the French writer Pierre Boulle. Though the film is a work of fiction, it is borrowed from the events that occured during World War 2 in western Thailand, where the original River Kwai Bridge has been constructed in Kanchanaburi. 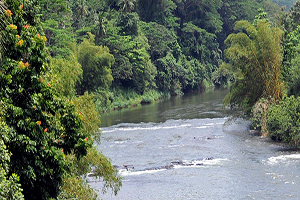 But for the movie, a more spectacular tropical setting was chosen: the jungle clad mountains in the Kelani river valley near Kithulgala. It became one of the most celebrated war movies of all time. Alec Guiness, for whom this was the breakthrough movie laying his international reputation, played the lead character, Colonol Nicholsen, for which he won the Academy Award for Best Actor. "The Bridge on the River Kwai" won in total 7 Academy Awards, including "Best Picture". The scene creation of the film was done in Sri Lanka, most of it in and around Kithulgala, including the famous bridge explosion, the culminating point of the plot. 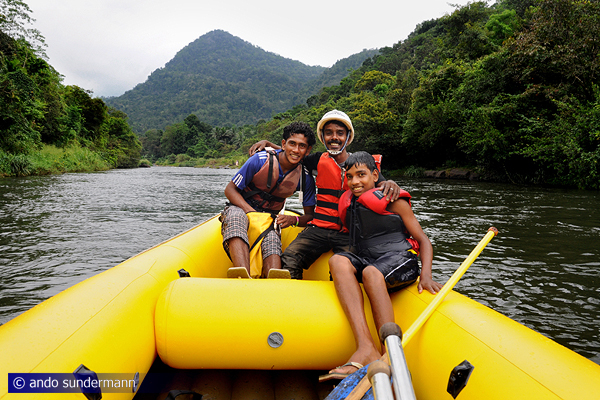 Kithulgala river rafting is a mix of exciting rapids with calm sections that also allow swimming in the clear water of the highland river Kelani Ganga. 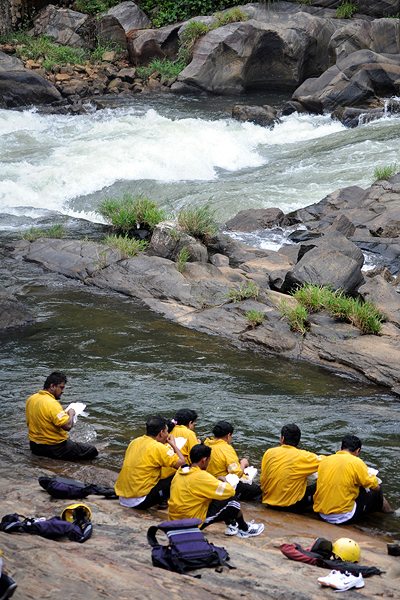 TThe seven Kithulgala rapids on a 7 km stretch of the Kelani river range from Grade 2 to Grade 4. (Rafting Grade 5 would be the most difficult one, Grade 6 would be impassable for rubber rafts.) Some names of the rapids are imaginative, such as Virgin's breast, Butter Crunch, Killer's Fall, White quarter, Head Chopper, Rafter's quarter. Paddling and safety instructions will be given prior to the whitewhater rafting, that you understand commands amidst the pounding water and have a better chance of remaining in the rubber raft. If you fall out, don't try to swim but hold fast onto a rock and just wait for your helper. Safety wests, helmets as well as drybags for electronic devices such as mobiles or cameras will be before tour start. When rafting, you cannot use cameras that are not watertight. There are many small canyons in the surrounding of Kithulgala, some of them hidden in the jungles. But one of them is easily accessible within a 15 minutes hike from the centre of Kithulgala. The stream in a side valley at the opposite (southern) side of the Kelani Ganga is called Kataran Oya, pronounced "Katarang Oya". It has several natural plunge pools and small rapids and waterfalls for sliding and jumping. 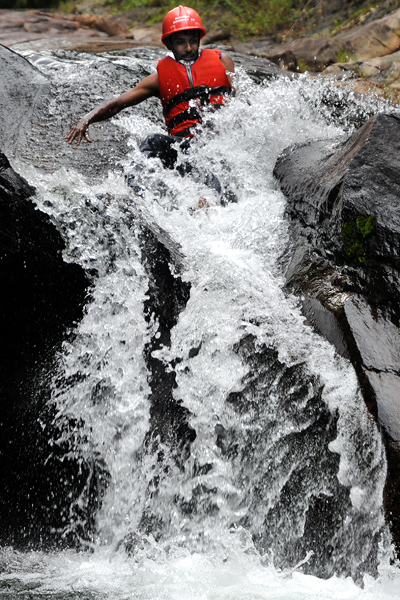 Kataran Oya can be called "the beginner’s canyon", suitable for those not used to canyoning activities. 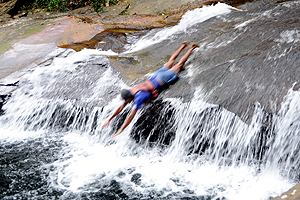 It's really a perfect weekend activity for the whole family, Sri Lanka's child-friendly canyoning opportunity, because rock sliding and other canyoning activities in the Kataran Oya are safe, if you follow instructions of experienced group leaders. Comprehensive safety briefing are provided for groups. In a larger distance, a 12 meter jump at the Marvel Canyon was opened by "Borderlands", a specialist for adventure holidays in Sri Lanka and Nepal. The hills surrounding Kithulgala are covered in dense rain forest, offering several one-day trekking routs. There are also camping sites for several days in the trekking area. But it can only be done with a guide. He will also be helpful to learn more about the fauna and flora in the Kithulgala Forest Reserve covers 263ha in the wide range of altitudes between 100 and 820 m. The Makandawa Rainforest Reserve is another popular hiking destination. The Kithulgala valley is full of beautiful sceneries and hidden waterfalls, Sri lanka's best area for waterfall trekking. Many waterfalls, for example Manneketi, are undisturbed off the beaten track. 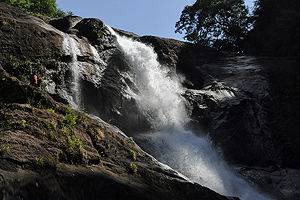 Sandun Falls, just like Beli Lena, can be reached by crossing rubber and tea plantations. The 30 m high Sandun Ella, also called Handun Ella, meaning "Sandalwood Falls", is Sri Lanka's best place for waterfall abseiling, enabling even unexperienced guests to slide down a roap within a roaring waterfall. Caving at Beli Lena Cave requires a rope and headlights for entry. Caving can only be done with professional guidance. Beli Lena, also spelt Belilena, is a prehistoric cave 8 km from Kithulgala. Beli Lena holds evidence of Sri Lanka's Balangoda culture. Microliths up to 30,000 years old have been found in this group of large rock shelters. Indeed, they are the oldest so-called "geometric microliths" at all, even older than African ones andmany millennia earlier than European. Sri Lanka's renowned archaologist Paul Deraniyagala excavated ten skeletons of Balangoda men, 16,000 years old. The site also yielded numerous remains of animals that served as food. Monkeys, porcupines and giant squirrels were included in the Balangoda man's diet. The findings are not in situ any more. 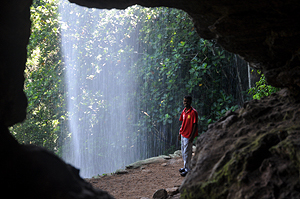 The caves, with a waterfall as a veil in front of one of them, are worth visiting for their natural beauty, even if you are not taking part in a caving tour. Kithulgala is a perfect destination for birdwatchers. Bird species of Sri Lanka's tropical lowlands can be studied here, as the Kithulgala area has most of the rainforest bird species that are known from Sinharaja, albeit in lower numbers. Due to the close proximity of the mountains, highland bird species, raptors in particular, can be sighted in Kithulgala, too. 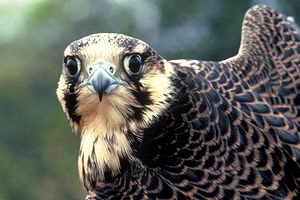 Besides falcons, the island's second largest bird of prey, the Mountain Hawk Eagle (Nisaetus nipalensis), can be seen in this area. Sri Lanka's most recently discovered bird, the Serendib scrops owl (Otus thilohoffmanni) was heard calling by Deepal Warakagoda initially in the rainforests of the river valley of Kithulgala, before this endemic bird was later on sighted in Sinharaja for the first time. Elusive endemic species like Sri Lanka Spurfowl (Galloperdix bicalcarata), Green-billed Coucal (Centropus chlororhynchos) and Spot-winged Thrush (Geokichla spiloptera) are easier to see. 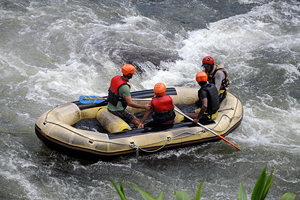 Though Kithulgala is the most popular site of river rafting in Sri Lanka, there are others, too: Sitawaka River off Avissawella with grade 3 and 4 rapids, Mahawelu between Ulapane and Gampola with grade 2 to 5 rapids. The Kothmale dam between Nanu Oya and Hatton is reducing the availability of other grade 4 and grade 5 rapids for experienced rafters.